Sean Connery’s out and Roger Moore’s in as 007 in the blaxploitation-era Bond pic with the killer theme song – Live and Let Die. This entry serves as a palate refresher after Connery’s rough final turn in the mostly execrable Diamonds are Forever. While Moore certainly looks the part, he’s the oldest actor to begin his tenure as Bond (at 45) and is in fact 3 years old than Connery. The producers countered by trying to add hipness by latching onto gritty 70s cinema tropes (like blaxsploitation and NYC cop movies) and hiring Paul McCartney to write the theme. Some of these ideas worked better than others. “Live and Let Die” is a harbinger of change for the Bond series, more straightforwardly rocking and contemporary than many of the torch songs that came before it. It’s also simply a great song period, and the recurring use of it as a theme elevates the whole film. A nice mission statement for Moore’s tenure as Bond, albeit one that clashes with his more erudite persona. It promises danger and excitement and the movie’s all too happy to provide. A quick pre-credits sequence (that doesn’t feature Bond at all) sees three MI6 agents murdered all across the globe. The New Orleans assassination features this quip at a jazz funeral: “Whose funeral is it?” “Yours!”, while the movie begins to hint at some voodoo weirdness as another agent is murdered via venomous snake in an ecstatic ritual. Moore’s Bond is tapped by M to investigate the murders (along with the CIA and another iteration of Felix Leiter), and ends up travelling to New York, New Orleans and the Caribbean island of San Monique in order to do so. He clashes with Kananga (Yaphet Kotto), whose vast drug empire is aided by NYC-based gangster Mr. Big. The plot is actually fairly streamlined after all the SPECTRE business in previous films, and allows the movie to simply drive ahead and focus on Bond stopping two tons of heroin from hitting the streets of America. 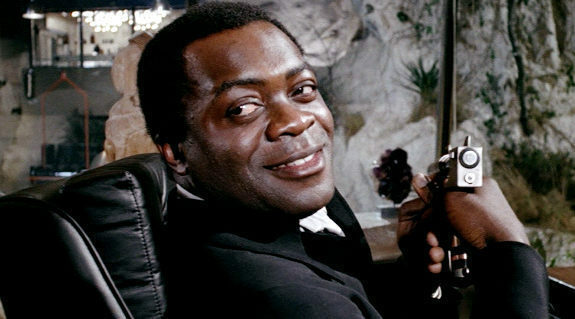 Yaphet Kotto’s an accomplished actor and he exudes menace as Kananga/Mr. Big (the former disguises himself as the latter under prosthetics for some reason). While another plus in Live and Let Die‘s column is its surplus of henchmen – there’s at least 3 memorable ones. Whisper is a giant of a man who can (of course) only speak in hushed tones, Tee Hee Johnson had his hand eaten by a crocodile and now sports a deadly metallic pincer in its place, and the flamboyant Baron Samedi is a possibly supernatural Voodoo priest of some sort. There’s some fairly solid fisticuffs throughout, and for the most part this is a more (Moore?) grounded Bond film than its immediate predecessor (though it still has outrageous moments). 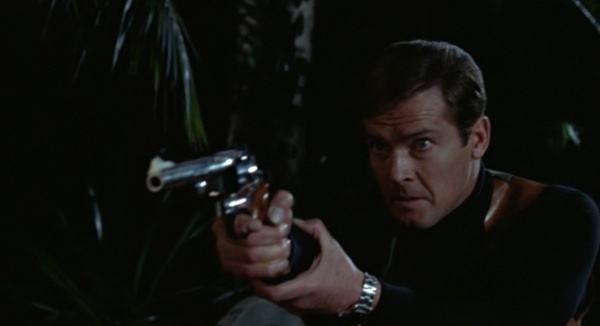 Bond doesn’t rely too much on gadgets, with his only his trusty magnetic wrist watch by his side. Moore doesn’t sell the physicality as well as Connery, although the stunts are of a higher calibre and much of it is well-staged and clearly choreographed. The standout sequence is a lengthy Louisana boat chase that features multiple jumps, a boat flying into a car, a literal crashing of a wedding, and an explosive climax. It’s pretty great and worth the price of admission. 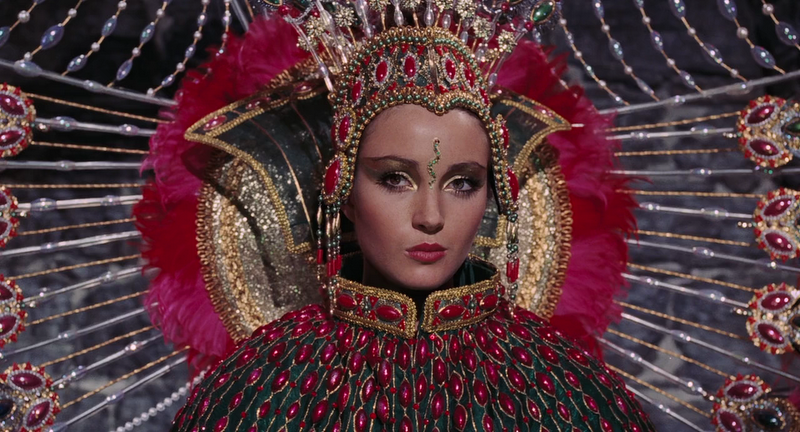 Jane Seymour (yes, the future Dr. Quinn the Medicine Woman) is ravishing as Solitaire, a virginal psychic for Kananga whose powers wane after she sleeps with Bond. She reads Tarot cards and after repeatedly seeing “The Lovers” card when James is near, she finally succumbs to his charms (Bond: “The deck was stacked in my favour”). Moore’s first scene as Bond finds him in bed with buxom Italian agent Miss Caruso (to which M later remarks, “The Italians were most impressed by how you handled the Rome affair”). After some mild slapstick involving Moneypenny hiding Caruso in a closet, Bond uses his magnetic watch to remove her gown (“Sheer magnetism baby”). Later, Bond is paired with CIA double agent Rosie Carver, who first fakes helplessness to trap Bond and later dies by Kananga’s orders. Of course, Bond beds her before she meets her demise, knowing full well she’s playing both sides. Moore’s a total cad in the role and he seems better fitted to the romance side of Bond than the pure action (and even in his debut he seems to be playing Bond with a bit of a self-aware wink). Live and Let Die (despite having an amazing theme) starts a little slow. The New York scenes are painful at times, filled with dialogue that aspires to sleazy hipness but falls way short (“Names is for tombstones baby, y’all take this honky out and waste him”). Muscle through, however, and Moore begins to shine as a fairly unflappable Bond that is above all spirited and fun. Strong characters, memorable set pieces and a brisk pace all elevate the second half. This is a new era for Bond, one in which he may never comfortably fit into to (Moore’s stiff upper lip seems to put him at a bit of a remove), but the filmmaking surrounding him here is solid and the story relatively tight and believable. A solid entry.